The problems of viruses and parasites that can not be eradicated have largely contributed to the decimation of the swarms that having a weaker immune system are increasingly attacked. ProBee® strengthens the immune system of the families through the administration of natural probiotics. Being an association of active prebiotics and probiotics whose functionality induces a positive effect on honeybees ProBee® is able to give a significant boost to the colony. Furthermore the same bacteria contained in ProBee® are used by the bees to prepare the bee bread through the fermentatin of pollen an nectar. A plentiful and high quality food is an imprtant conribution to the health and numerosity of the families. ProBee® represents a new frontier for obtaining and maintaining the health of hives. And is a product easy to apply, with many benefits at a low cost. 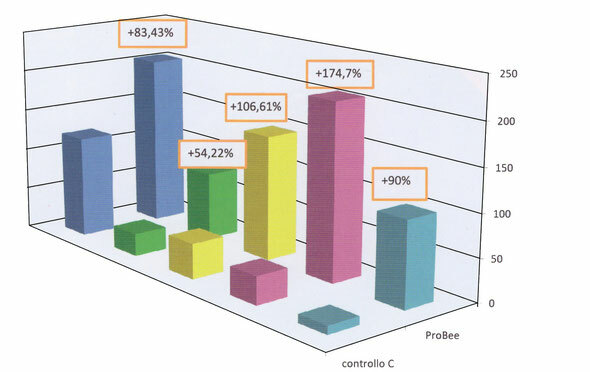 In the picture belowe the changes in percentage at the end of a treatment cycle. Not last is to be considered the beneficial effect that the treatment has on the environment. We also believe in the efficacy of bioremediation. Starting from the administration of probiotics in a hive, the helpful bacteria will spread from bee to bee, improving the welfare of the family. But the positive impact does not stop there. In fact, honeybees, moving in the environment, release bacteria that will interact with the surrounding flora and fauna, generating a widespread improvement of the entire ecosystem. ProBee® effects on bees family. For more detailed specifications and scientific insights see section Resources.